Nearly everything in Nova Scotia revolves around the water, which means a visit to this Atlantic Canada province brings the opportunity for a host of maritime adventures. In fact, there are so many it can almost be overwhelming, but we’ve made that a little easier by highlighting the best of the best of Nova Scotia’s activities on the water. 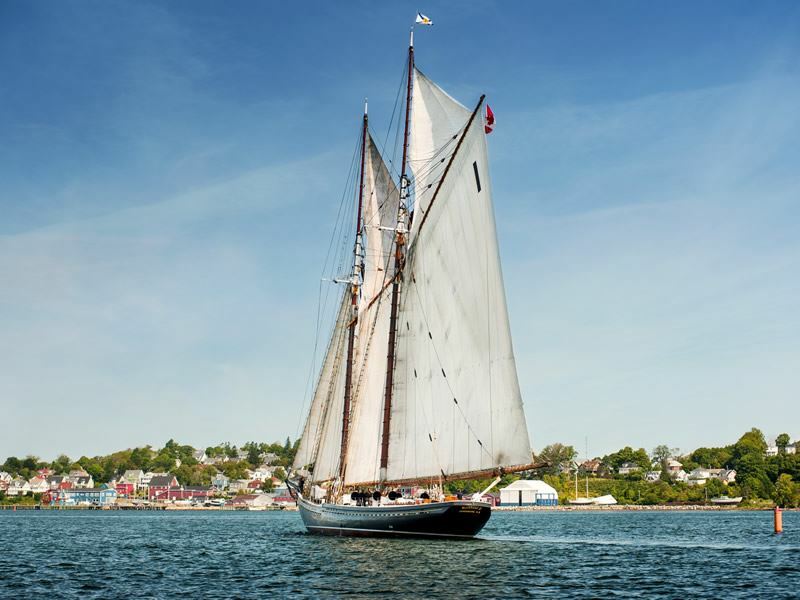 The original Bluenose is depicted on the Canadian dime, built to compete for the International Fisherman’s Trophy. She won her first race in 1921, and over the next 17 years, defeated all contenders, becoming the pride of the province. Just a few years after the vessel was sold to the West Indian Trading Company in 1942, she struck a reef and sank. The Bluenose II is an authentic replica which sails out of the picturesque 18th-century French harbour town of Lunenburg, and is considered the sailing ambassador for Nova Scotia today. 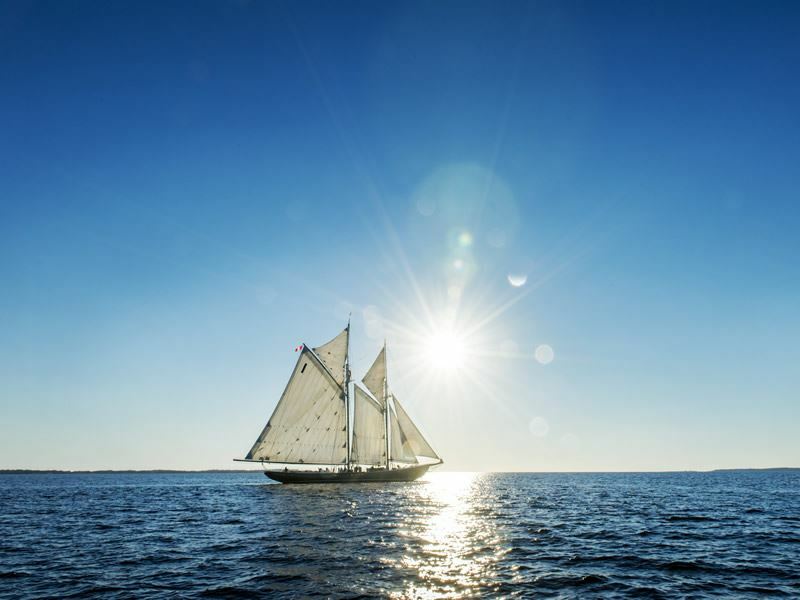 Visitors can sail on the Bluenose II from June 1 to September 30, and even find out what it would be like to be part of the crew by signing up for Deckhand for a Day. There are usually a couple of dates during the season this is offered, so you’ll need to plan well in advance, but it’s sure to be something you’ll never forget. You’ll get a safety orientation, learn about the history of the tall ship, and while you’re sailing around Mahone Bay, you’ll get a turn at the wheel as well as the opportunity to learn knots, splicing and how to anchor the 300-ton schooner. 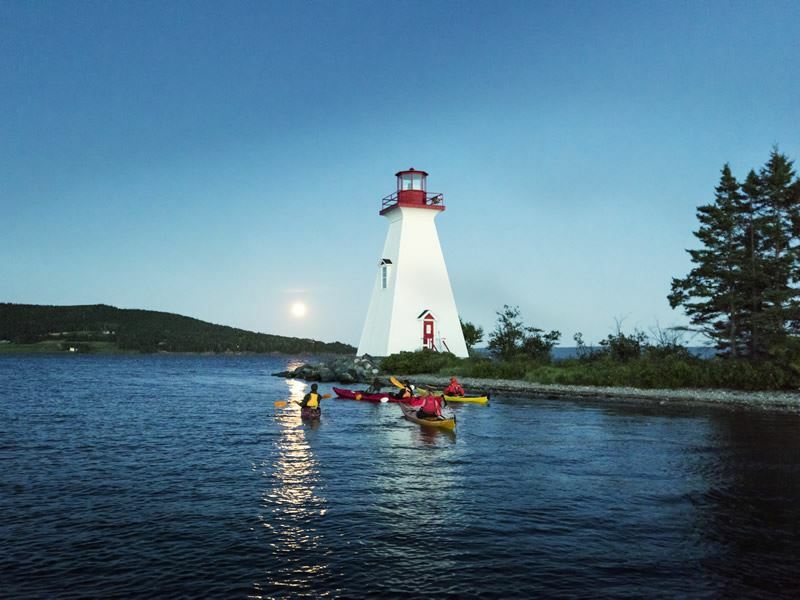 Kayaking in Nova Scotia brings the chance to paddle around the island-dotted bays, and alongside seals and porpoises while gazing up to see a bald eagle or an osprey soaring above. 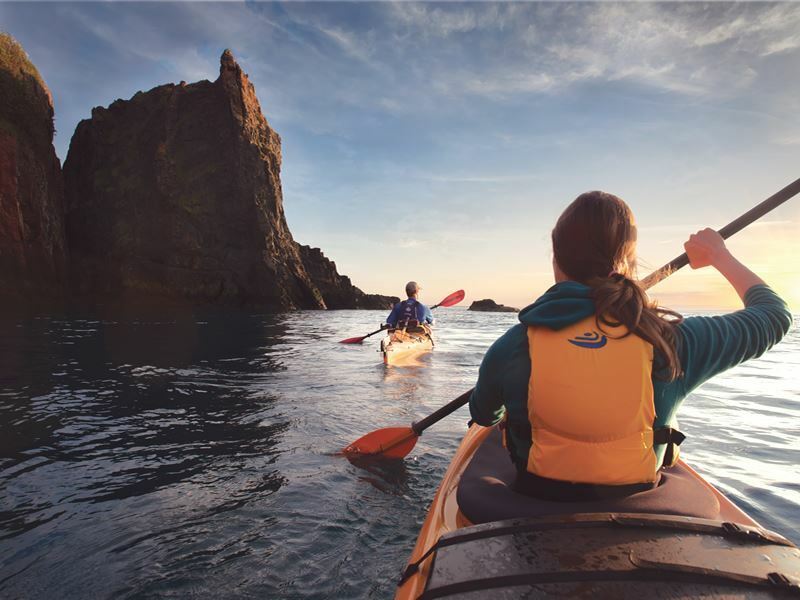 There are numerous outfitters throughout the province where you can rent a kayak to get out and explore coastlines with dramatic cliffs, hidden coves, remote beaches, sea caves and view all types of marine life. History buffs may want to paddle along one of the many history waterfronts like Halifax or Lunenburg. If a guided tour is what you had in mind, there are a wealth of options for that too, from shorter two- to three-hour trips to multi-day excursions, and most are open to paddlers of all abilities, including beginners. East Coast Outfitters offers a wide range of tours, including half-day and full-day daily guided tours from Lower Prospect, just a 30-minute drive from Halifax. This area is known for its unspoiled islands, beautiful beaches, sheltered inlets and fascinating rock formations, as well as wildlife, with common sightings including bald eagles, porpoise, seals, and even whales. The Highlands of Northern Cape Breton are one of North America’s most impressive paddling destinations, where you can paddle to waterfalls, soaring arches, and sea caves. Cabot Trail Adventures offers a half-day guided kayak tour in this region, which includes exploring the pristine barrier beaches and saltwater marshes. Kayak rentals are also offered by the hour or by the day. Or, you could always kayak the world’s highest tides on the Bay of Fundy in the Cape Chignecto area, a wild, untouched landscape best explored from the water. A kayak will allow you to get up close to the rocky spires, including the iconic Three Sisters, cliffs, arches and rock amphitheatres. Nova Shores offers one-, two- and three-day trips from Spicer’s Cove, which includes a visit to the Tree Sisters. Longer tours can go around the entire coast of Cape Chignecto Park or to Seal Cove. Stand-up paddleboarding, or SUP, has become incredibly popular in recent years, and Nova Scotia has caught on too. Somewhat of a cross between surfing and kayaking, it’s a great way to have a good time out on the water, and get in a good workout too. Whether you’ve never tried to or are highly experienced, Nova Scotia is an ideal place to enjoy the sport. 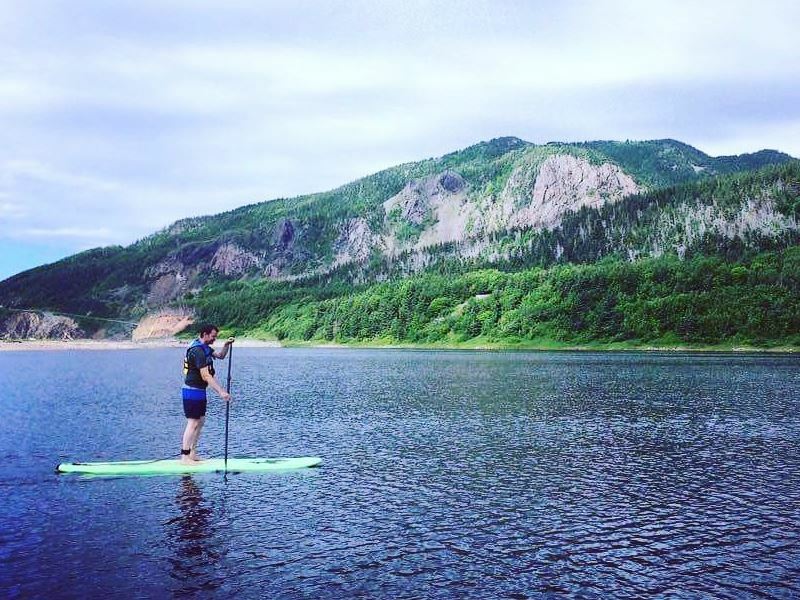 CB West Paddle Boards offers both rentals and guided tours along the Cabot Trail on Cape Breton Island, with multiple options available. The Cheticamp Harbour paddle allows you to view the vibrant Acadian community of Cheticamp from the water, and learn more about the history and culture of the Acadians, as well as soaking up some spectacular vistas of Cape Breton Highlands National Park. If you want to paddle near Halifax, East Coast Outfitters, better known for its kayak tours, also offers stand up paddling lessons and rents boards by the hour, half-day or full day. 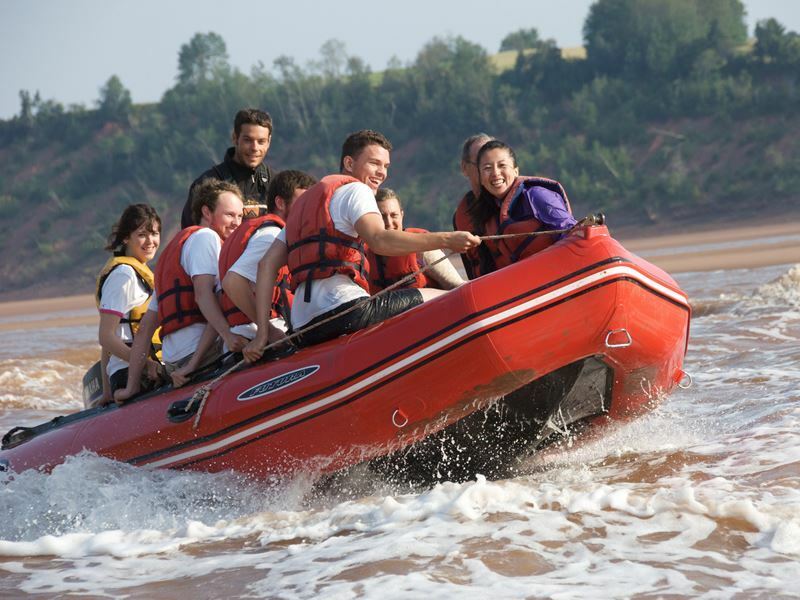 Here you can also experience rafting in a way that’s unlike anywhere else: tidal bore rafting. This activity is powered by the Bay of Fundy’s world famous tidal bore. You’ll hop in a whitewater Zodiac boat and actually feel the rush as you ride the 8-foot waves of the world’s highest tides, sort of like a water rollercoaster. Expert guides bring passengers over the white-capped rapids, as the incoming tides of the ocean reverse the flow of the river. You’ll be peacefully floating along a tranquil river one minute, enjoying the dramatic scenery, and suddenly, you’ll see it the water transform into ranging rapids. When the tide changes, the bore temporarily reverses the flow of the river, which creates the rollercoaster-like rapids. Many consider tidal bore rafting to be a must-experience in Nova Scotia, as it can’t be experienced in any other spot on the planet. Tidal Bore Adventures offers two short, two-hour-long tidal bore rafting trips, and one longer four-hour trip, starting from Gosse Bridge in Green Oaks. You don’t have to do any of the paddling, you’ll just sit back and enjoy the ride. Every tour also includes the option to go mud sliding on the Shubenacadie River. You’ll climb to the top of a steep hill made of pure clay, and then slip and slide down the muddy banks, right into the water. Your choices when it comes to boating are practically endless in Nova Scotia. If tidal bore rafting sounds a little too thrilling, you can take a boat tour to experience the world’s highest tides in the Bay of Fundy with a number of outfitters, including Advocate Boat Tours which launches from Advocate Harbour on the upper Bay of Fundy. 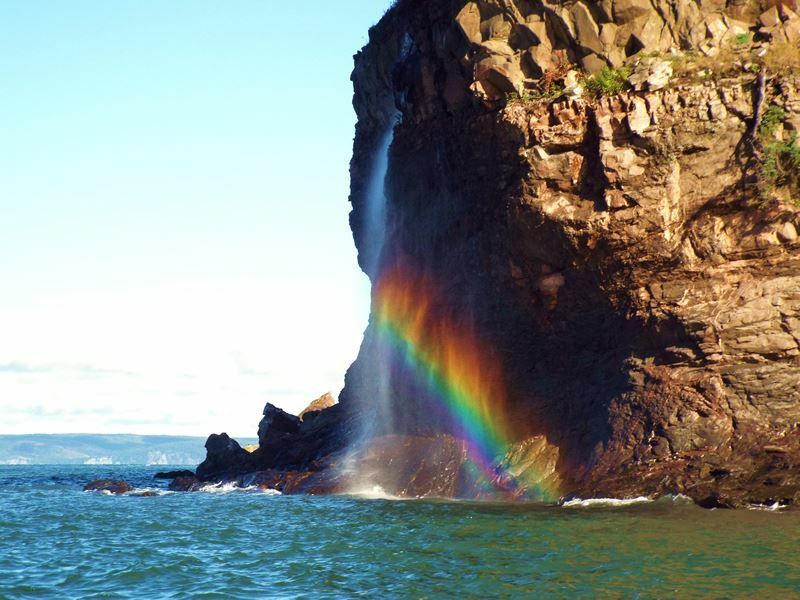 There are trips to Isle Haute that include wildlife viewing opportunities, coastal tours along Cape Chignecto Wilderness Park and many other options. If viewing puffins up close is something you’ve dreamed of, you may want to take Donelda’s Puffin Boat Tours on Cape Breton Island. This is the only Bird Island boat tour on the Cabot Trail that will bring you to the Atlantic puffin’s nesting grounds, and sightings are guaranteed. Bald eagles and grey seals are often spotted too. Peggy’s Cove Boat Tours in Lunenburg offers a lobster dinner cruise throughout the summer months, from June to September. It not only includes the chance to savour juicy, fresh Nova Scotian lobster, but to enjoy marine life sightings, and learn about local points of interest and folklore. While you’re in the area, you can also view one of Canada’s most famous lighthouses, the Peggy’s Cove Lighthouse, which marks the eastern entrance of St. Margaret’s Bay and was first lit in in 1915. The image of the lighthouse on top of the huge rocks with the Atlantic waves crashing against it is a breathtaking sight. Tusket Island Tours offers unique tours to the Tusket Islands, known for their rich history and culture. Passengers can step in the shoes of a lobster fisherman to learn how to haul up a lobster trap and will visit a private fishing shanty and workshops on Big Tusket Island, as well as enjoy fresh, local seafood chowder and live entertainment. You might be surprised to learn that Nova Scotia is a prime surfing destination, from August through September due to the hurricane season swell. The water won’t be warm, but if you love the thrill of riding the waves, it’s one of the best cold water surfing spots. You’ll find surf shops throughout the province, many offering lessons as well as rentals. Less than 30 minutes from Halifax, Lawrencetown is the place to go for those who live in the city. It draws surfers from across the globe as well, and there are three top spots for picking up surfing gear or taking lessons: Happy Dudes Surf Emporium, the East Coast Surf School, and Kannon Beach Wind & Surf. Martinique Beach is an hour from Halifax and is considered one of the best surfing beaches in Nova Scotia. It’s also the longest stretch of beach in the province and can be surfed year round. Cow Bay on the Eastern Shore is rarely crowded, yet it offers reliable surfing conditions no matter what the season. On Cape Breton Island, Ingonish Beach has only recently been discovered for its fantastic surf. It’s an exposed beach break that in good conditions makes for a great ride. 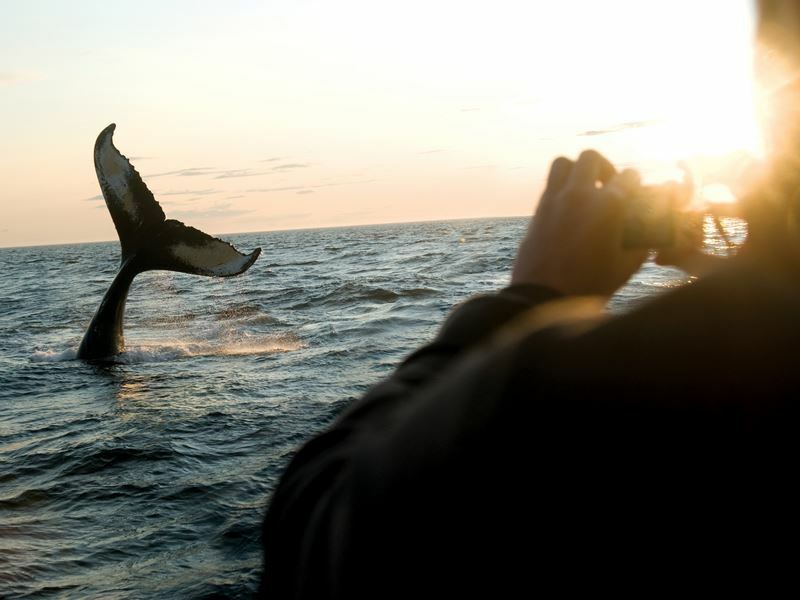 Finally, whale watching is one of the top reasons visitors head to Nova Scotia. It’s one of the best places on Earth to see whales from May through October, with the chance to view minkes, finbacks and humpback whales, as well as the occasional pilot whale and orca. The best vantage points for viewing from shore are along the Cabot Trail in Cape Breton and around the Bay of Fundy, but you’ll want to get out on the water by joining a whale watching tour for the opportunity to view them up close. Passenger cruise vessels and zodiac boats are most often used for the excursions, so you’ll have your pick of a more comfy, family-friendly journey or the chance to ride near the surface of the water. Oftentimes, the curious whales are drawn to the boats, trying to figure out what all the commotion is. Some boats include hydrophones which allow passengers to listen to the songs of the whales as well.